Maker plans an array of battery vehicles and even a hydrogen car – but still is betting big on hybrids. The Prius FT-HC concept could soon morph into a production vehicle, Toyota planning to use the Prius badge on a "family" of hybrids. Toyota will introduce an all-new hybrid-electric vehicle that will share the Prius badge with the maker’s existing 4-door hybrid, the first step in a strategy to turn the Prius name into a green-tinged brand-within-a-brand. “It will be an all-new model,” said Don Esmond, the senior vice president of automotive operations for Toyota Motor Sales USA, during an appearance before the Automotive Press Association. And it will make its first appearance at the Detroit Auto Show, in January 2011. While he hinted it will be “more stylish” and “more versatile,” Esmond shied away from offering any other hard details other than to say it will be part of a growing “family” that will share the Prius name with the original hybrid. 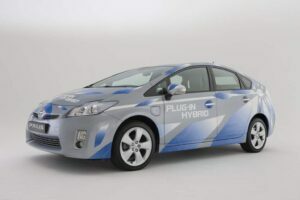 That Toyota model remains not only the most popular of Toyota’s gas-electric models but accounts for roughly half of all hybrids sold in the United States. Esmond did suggest there are at least two key niches that Toyota would like to expand the new Prius family into. The first would be a larger model, probably a crossover. The other would be an even smaller and less expensive hybrid offering, which could mean something in the $15,000 range. The timing of the concept reveal would suggest the new Prius-badged hybrid could make it to market as early as the 2012 model-year. Expanding the use of the Prius badge is potentially risky, especially if a new model falls short of expectations, but because it has an extremely high consumer awareness factor the approach also offers a potential kick-start for any new model. With only a 13-mile battery range and a top speed of 62 mph in EV mode can the Prius Plug-In compete? 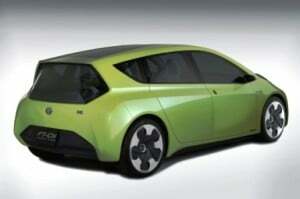 Toyota will also expand the functionality of the existing Prius sedan, in 2012, when it introduces a plug-in hybrid version. That model will allow a user to charge up its larger, lithium-ion battery pack using household current, much like the new Chevrolet Volt. But where Volt promises to deliver 25 to 50 miles per charge, depending on driving conditions, at speeds up to 100 mph, the Prius plug-in will manage, at best, 13 miles and a top speed in battery mode of just 62 mph. Some observers question whether that will offer much more value than the existing Prius. There’s little doubt Toyota is, in fact, concerned about the increasingly competitive nature of the auto industry, especially when it comes to “green” powertrain technology. The maker initially discounted the benefits of lithium-ion technology and Esmond cautioned it’s still unclear whether battery power will really live up to consumer needs and expectations. But that caution – and some technical snafus Toyota experienced in developing a competitive lithium battery – have put the maker behind key competitors, not only including GM but Nissan, which will launch its Leaf battery-electric vehicle later this year. “But we’ll compete,” Esmond declared, adding that Toyota has plans for “a battery-electric vehicle or two” of its own, starting with the RAV-4 EV. That model, developed in cooperation with California’s Tesla Motors, will debut at the Los Angeles Auto Show, next month, and also reach showrooms in 2012. The maker is clearly not confident battery propulsion has a lock on the auto industry of tomorrow. By mid-decade, said the Toyota executive, there are plans to come to market with a mass-produced fuel-cell vehicle. Using super-clean hydrogen, many advocates still believe fuel cell technology will be the eventual winner in the race to develop truly green propulsion. The key to the future, Esmond stressed, “is the infrastructure.” And right now it’s easier to charge up battery cars than pump hydrogen. For the near-term, Esmond insisted “Hybrid technology serves as the core to our environmental approach,” but the maker also believes it can significantly improve the efficiency of its conventional gasoline engines, as well. During his speech and a subsequent question-and-answer session, Esmond alternately expressed his concerns about the problems Toyota has faced since it announced its first recall for sudden acceleration, in October 2009. He conceded that the company made some mistakes in the handling of its various safety problems, in part “because we grew too fast,” and because of its over-reliance on a Japanese-based management structure. “There were some decisions made in Japan that could have been better-made if decisions were made on this side of the water,” said Esmond, adding that a number of steps have been taken to de-centralize management, especially when it comes to acting on local safety and quality concerns. While it has “obviously been a very difficult year for Toyota,” Esmond, a former Marine helicopter pilot, insisted the automaker is starting to regain lost ground. He suggested loyalty rates are rising again, as is Toyota’s ability to “conquest” customers from other brands. And considering just retail sales, he said, the maker is now the largest in the U.S. market, with a 17% share. This entry was posted on Thursday, October 14th, 2010 at and is filed under Automobiles. You can follow any responses to this entry through the RSS 2.0 feed. Both comments and pings are currently closed.